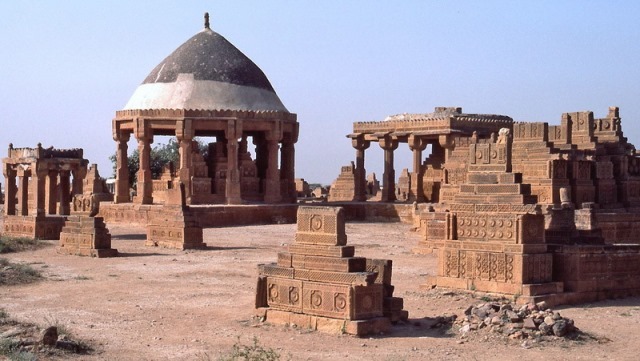 Thatta also boasts one of the biggest and most well-known necropolises in the world: the Makli Hill Necropolis. Situated just outside the town proper, this necropolis holds the remains of more than 100,000 persons, a large portion of them people of note and former rulers and leaders in the area. It is a UNESCO World Heritage Site and has served its purpose for centuries, with historians and archaeologists estimating it to date all the way back to the 1300’s. As such, one may well expect the approximately 15-kilometre area of the place to be teeming with graves and monuments, from simple graves with Quranic art inscribed on them to the grandest of vaults, huge crypts topped with the traditional “onion bulb” mosque of local architecture. While most of the pilgrims coming here do so to visit the tombs of the many famous Sufi saints buried in the place, it is undoubtedly the large mausoleums of the past kings that capture popular tourist attention. Banbhore is also near the city. This is yet another tentative entry to the UNESCO World Heritage list, renowned for its status as one of the most impressively preserved ports from mediaeval times in the region. A port in use to the 1200’s, it is said to have begun its life as an urban location as far back as the first century BCE. The Shah Jahan Masjid of Thatta is another place worth visiting around the area, as well as another tentative entry to the UNESCO list. The mosque, which one may guess from the name to have been commissioned by the same emperor who commissioned the Taj Mahal, is a superbly decorated mosque of rather marvellous acoustic properties. Despite its size (169×97 feet), the acoustic properties of the edifice are such that it is possible for a word spoken in one end of the prayer hall to be heard at the other end. Of particular interest here are the architectural decorations as well, which involve no fewer than 93 domes crowning the building, some intricate tilework, and equally beautiful mosaics. There are natural sites to visit around Thatta as well. The best places to go to, if such is your interest, would be the two lakes nearby: Keenjhar and Haleji. Both are large lakes, the former being the biggest of all of the country’s freshwater lakes and the latter being the biggest of the continent’s bird sanctuaries. They are both a havens for local wildlife and wildlife enthusiasts, so they are fairly popular with tourists as well as travellers. Keenjhar, in particular, often draws a good crowd of swimmers and water sports lovers.